Last year readers enjoyed sharing what they had in their refrigerators after the holiday, so I thought I would ask again. Remember, you don’t have to be after a major holiday to play. I’ll start off by sharing what’s on my stove. I put up a pot of soup to preserve some of the leftovers. So far it includes onions, a leek, sweet potatoes, mushrooms, parsley, tomato, and some cooked black-eyed peas along with their cooking water. 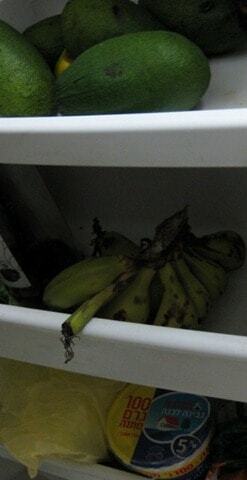 a few ripe bananas, which I am contemplating freezing. All in all, not bad. At worst the avocado might develop a few brown spots that we’ll remove, and the rest will keep or get eaten soon. Tomorrow I’m planning to make and freeze potato kugel (pudding) with some sorry-looking specimens. The potatoes and ripe avocadoes are the result of buying from a group order. In case you’re curious how my Rosh Hashanah menu worked out, in the end we made quinoa with mushrooms instead of the stuffed cabbage. It just seemed too complicated at the time. The family was happy with the lighter but less traditional menu. So be brave, tell us what’s in there! We ate leftovers through last night & yet I still have roasted root vegetables in the fridge, 1/4 appla cake, & 1/2 challah. I put 4 cups (4 meals for the 3 of us) of brisket in the freezer.